By JUDITH KOHLER | The Denver Post–A bill overhauling how oil and gas will be regulated in Colorado won final approval in the House on Friday morning, putting it one step closer to the desk of Gov. Jared Polis, who has supported the legislation. 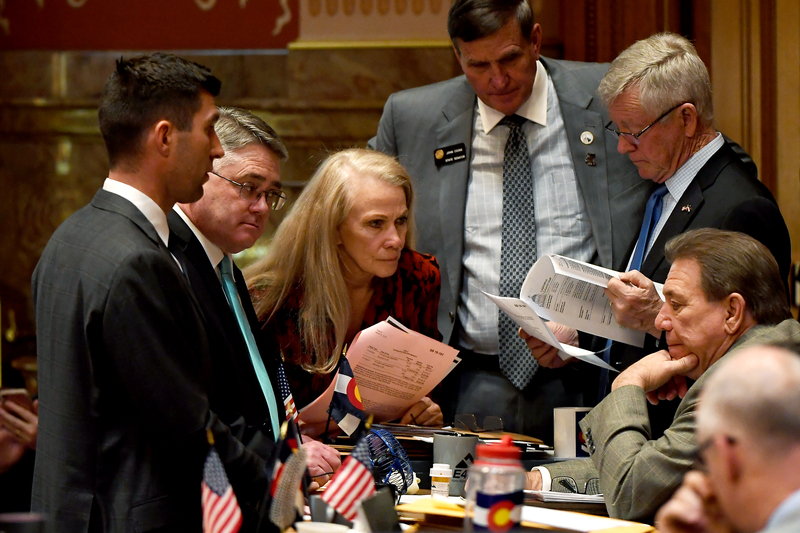 Joe Amon, The Denver Post From left, Republican state senators Owen Hill, Chris Holbert, Vicki Marble, John Cooke, Bob Rankin and Ray Scott look over Senate Bill 19-181 as it is debated at the Colorado State Capitol on March 12, 2019, in Denver. The bill, which was approved in the Senate and then recently the House, will significantly overhaul regulation of Colorado’s oil and gas industry.